Welcome to GammonSite's Frequently Asked Questions page. GammonSite was designed to offer you the very latest in unique features and options. Our site includes a built-in browser, 3D game boards, internal e-mail, live hosted Tournaments nearly round the clock, a generous sponsor program and much much more. We also offer leagues, $$$ blitzes and live games with players from around the world. To make you aware of some of our features, we have compiled this FAQ to assist you. It is impossible to answer every question here so please know that we offer a staff of sysops, greeters and hosts who may also assist you. Double left click on their nickname and the invitation will open. Make sure the player is ‘in green’ (free for invite). If they are in a Tournament, observe mode, away or playing, the invitation will not open. Choose the variation and match length and click Send button. Note: To change match length or game variation, use the down arrows. What backgammon variations does GammonSite have? Regular backgammon, LongGammon, NackGammon and HyperGammon. Can I play unrated games? Yes, just check the unrated game box in your invitation prior to hitting the send button. The ELO rating system calculates the relative strength of a player. The inventor, Professor Arpad Elo; a Hungarian born American physics professor developed this rating system for use in two-player games such as Chess and Backgammon. It bases your wins vs losses and calculates them to arrive at your current rating or ELO. Can I check the ELO change prior to playing a match? You can see the Elo change in the invitation. It will show you the Elo change after the game is played. It also indicates your opponent’s current Elo and experience. In addition, GammonSite has a built-in Elo calculator button located in the lower left of your screen. Highlight a player’s nick, then click on the Elo calculator button. Adjust the match points using the up/down arrows and your Elo change is automatically displayed. Can I reject an invitation? Yes, click on the Decline button. Someone invited me to play a variation I am unfamiliar with. If someone invites for a match length or game variation that you don’t want to play, hit the Counter offer button in their invite and make your change of game preference. Hit Send button. Or you may simply decline the match. How can I practice other variations of backgammon? You can invite eXtremeGammon for unrated matches of HyperGammon, LongGammon, NackGammon as well as regular BackGammon for unrated practice games. Use the down arrow in the invitation to select the game variation you would like to play. eXtremeGammon is available to Guests and Members alike and can be set for various playing levels. Where can I see GammonSite’s Top Players? Click the Ratings button at the top of your screen (to the left of Exit button). It will show you the ratings for the top 20 rated players, as well as your own. Invented by John R. Crawford – Used in match play, when one player reaches a score in the match where he needs just one more point for victory, his opponent may not double him during the next game. The rule was apparently invented to reduce the luck factor. If the trailing player wins the Crawford Game, the doubling cube again becomes available in the following games. Invented by Oswald Jacoby; this rule states that unless either player has accepted a double, gammons and backgammons will count only as a single game. The rule eliminates situations where a player has passed up the opportunity to double and therefore speeds up play. It actually encourages a player to double at the right time. Where can I find information on Match Policy? No, only regular Backgammon and Nackgammon will affect your elo. LongGammon and HyperGammon are always unrated unless they are Tourney games. Can I set my dice to auto-roll? Yes, Click the No double button. 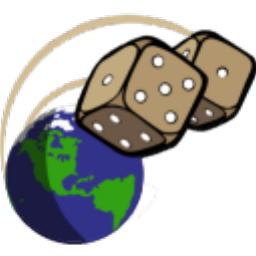 Your dice will now roll automatically. However, if you wish to double, you must turn it off again. How can I avoid having to click on my dice after every roll? You can shut the confirmation option off. Click on the Backgammon Game button in upper part of screen. Then go to Options/Game Settings/Uncheck Confirmation On box/OK. If you shut your confirmation option off, you may increase your cancellation delay if you decide not to confirm your move. You will find this feature in the Preferences button when you have a game table open. For example: The default setting is 250 ms. Increase the time to 1600 ms. By doing this you are allowed time to cancel your move and redo it before your turn ends. You may also choose to increase your minimum delay between moves from 500 ms to 1200 ms.
How can I customize my game board? Click on the Backgammon board icon at the top of your screen. Click on the Options button located inside the window (not the Options button at the top of your screen). You will get a drop down menu with options to change Board, Sound and Game settings. How can I undo a move? 1. You may undo a move by clicking the Cancel Move button located below your game table. However, please know that if you have clicked on the dice to confirm your move, it is to late to undo the move. 2. You may also undo a move by right clicking anywhere on the board. Again, if you have confirmed your move, it is too late to undo the move. How do I stop watching a game? To leave a game that you have been watching, click the Stop Watching button located under the table. How do I stop the public chat sounds? How can I chat privately with a friend? Right click on their name and select Send a message. Or easily create a chat button for your friend by right clicking on their name and choose Create Assigned Chat. Can I turn off the Tourney Announcements? Yes, Click on the Tourney button (or Trophy icon). At the bottom of the page you will see Tourney Announcement Messages. Make your changes there by unchecking any areas you do not want to receive the announcements. You can always see the next Tournament by looking at the Tournament Banner above your chat window. Can I rest my ELO points back to 1600? Yes, this is permitted once a year for Members only. Click on Options button, then Reset Rating button. Click Apply/OK. Click on Status button in upper right of your screen. Fill in your account name and password. You will see your account information, including expiration date, free time won for tourney prizes and free time earned for sponsoring players. What is the sponsor program all about? What payment options does GammonSite offer? We currently accept payment by Visa, MasterCard, Discover, PayPal and U.S. money order or check. Yes; and you have the option of buying a gift membership anonymously. If I am in Privacy Mode, can I speak to a friend? If the player is offline, go to Options/Players/Friends. 1. Click on your friend’s nick to highlight. Check the box that says Always visible to player. The privacy icon should now appear before their nickname. Click Apply/OK. 2. Send your message as your normally would by right clicking on their nickname in Community Room and select Send message. Can I change my Tool Bar? GammonSite e-mail works like your regular e-mail, but is for internal use only. You may set a timer to check for mail more quickly. Click Options button (near Exit button). Click Main and adjust the Check Mail every _ _ minutes. Click Apply. How do I send mail to multiple people? Please check the Options button located at the top of your screen. There are many options to customize your site the way you want it. You will see Main, My Account, Language, Players and Lists. By clicking on the + sign in front of each category, you will see the subcategories. Remember to hit Apply when you make changes. Can I create a mailing list? 6. In large area type your list following the above instructions (semi-colons between nicks and no space. 8. At the top of your Friends list you will now see a yellow envelope which contains your mailing list. Double click on it and a blank mail will automatically open with the list of your friends, joke list pretyped in the addy line. What is the Browser button? GammonSite’s Browser button is one of the most unique tools available anywhere. It allows you to surf the web without ever leaving our site. Simply type or copy and paste the web address and click on the second arrow. To close, click on the blue X. What is a Web Cruise? Can I put someone on Ignore? Yes. If the player is online, right click on their nickname and select Add to Ignore List. If the player is offline, click on the Options button/Players/Ignore. Type the nickname in the small white box and check the box Ignore Public and Invitations. Click on Apply. You will no longer see public messages, receive e-mail, private messages or game invitations. How do I create a Friend’s List? Right click on a nickname to add someone to your Friend’s List. You may view your friend’s list by clicking Options/Players/Friends. My status keeps changing to Away. How can I fix that? After a period of inactivity, your status will change to Away. You may click on the Change Status button at the bottom of your screen and select Observing or Free to be Invited. If you would like to set this automatic status change to a longer period of time, click Options button/Main and adjust the time in Set as away after _ _ minutes. Click Apply. If you would like to set an Away message, type it in the white box under ‘Message to be sent when set as Away’. Click Apply. Anyone trying to contact you by personal message will receive your away message. How can I post my image? You must be a Member to post your picture. (This is an option not available to Guests or Trial Members). Please note that the maximum picture size cannot exceed 30 KB. If you were successful, your image will now say that it is waiting to be approved by GammonSite. Once you have received approval, your picture will be displayed in your info card. To change your picture, click the Remove Picture button and repeat previous instructions. This is permitted once a year for Members only. Click on Options button, click on Rename. Enter your new nickname. Click Apply/OK. Who can play in Tournaments? Members and Trial Members are permitted to play in tourneys. Click Tourney button in upper left of screen. Right click on the Tourney and select Sign-Up. Watch Personal chat button for pairings. Is there a list of upcoming Tournaments? Click Tournament button in upper left of screen. You may also look at the Tourney banner above the chat window to show you the next schedule Tournament. If you look at the list of Players, click on the word ‘Name’ above that list. It will put all names in alphabetical order, making it much easier to locate your opponents. How much FREE time can I win by playing Tournaments? You can earn free time equal to the length of membership you purchased. If you purchased a one year membership, you can earn one free year. What Tourney formats does GammonSite have? SINGLE ELIMINATION – You continue to play until you lose a match. DOUBLE ELIMINATION – This format is 2 Tourneys in one. There is a Main Tourney and a Consolation Tourney. You play in the Main Tourney until you lose a match. Then you move to the Consolation Tourney. You must lose 2 games to be out of the Tourney. SWISS – You will play a number of rounds whether you won or lost previous matches. The Tourney host will announce the number of rounds at the beginning of the tourney. That is the number of matches you will play (win or lose). If you leave the Tourney for any reason, you will forfeit any unplayed matches. In Swiss format only, if you time out on a match you are still expected to play the remaining rounds. The winner will be the player that won the most matches and has the highest SB. ROUND ROBIN - You will play every player that has registered for the Tourney. Win or lose, you continue playing until you have played everyone once. If you leave the Tourney for any reason, you will forfeit any unplayed matches. The winner will be the player that won the most matches and has the highest SB. MULTI - This Tournament includes all GammonSite’s backgammon variations (NackGammon, LongGammon, HyperGammon and Regular Backgammon). It is a Single Elimination format (you play until you lose a round). NOTE: Please pay attention when a host is advertising an upcoming Tournament. You will see information as to the format, # of rounds, game variation, etc. You may also get this information by holding your mouse over the Tournament Banner at the top of the chat window. You may also click on the Tourney button in upper left of screen; click on any Tourney and click on Details button. What Tie-breaking systems does GS use? Swiss Tourneys: Ties are solved using the Bluchholz system. It is the sum of all the points of the players you played; the idea is that the same score is more valuable if achieved against players with better performances in a given tournament. Round Robin: Ties are solved using the Sonneborrn-Berger system. It is the sum of the points you won against each opponent you defeated. If you beat a player with a higher Elo and more experience, you win more SB points. How can I check current standings in a Tourney that is running now? Can I review Tourney results in a recently finished tourney? When you win points in a Tourney, those points accumulate for the month. Members and Trial Members may participate. The top 16 players at the end of the month compete in the Monthly Play-Off Tournament. The winner receives 2 FREE weeks and carries a trophy for the month. The monthly Play-Off Tourney is held on the first Sunday of the following month at 2:30 pm EST. To check current standings, click on Tourney button/Standings button. A monthly Tournament where the ladies battle the men! The men play in their tournament and the ladies play in theirs. The top lady and the top man compete in a play-off. The winner receives 1 FREE week and carries a Trophy for the month. It’s a fun and very competitive event in which many players are eligible to participate. It’s open to Members and Trial Members. Battle of The Sexes is held on the third Sunday of every month at 2:30 pm EST.